Extra, extra! 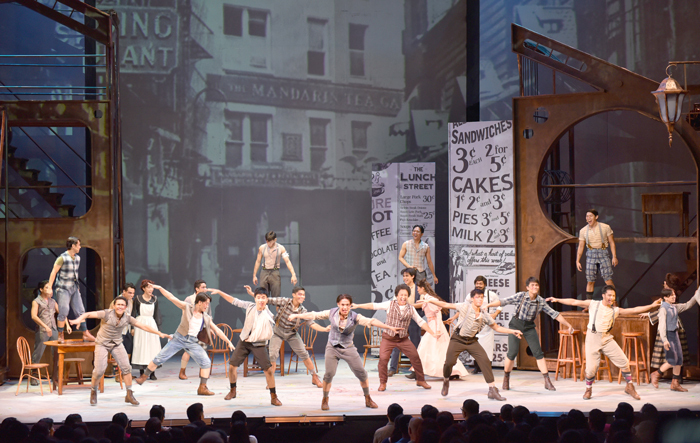 Globe LIVE and 9 Works Theatrical’s production of Disney’s Newsies is bringing in rave reviews and packed audiences, and those who haven’t seen it still have time to catch what many are calling a dazzling and spectacular show. "Globe Live and 9 Works Theatrical have created a triple-threat extravaganza that rivals some of the best local productions seen in recent memory," from Broadwayworld.com. Newsies is a Broadway musical based on a 1992 Disney film. It is loosely based on the real-life 1899 newsboy strike in New York City, where a group of boys initiated a strike hoping to improve how the child labor force of newspaper hawkers were compensated. “Newsies is one of Broadway’s most difficult shows to produce because it demands its actors to be able to sing, dance, and act. We were able to pull it off with 19 out of 19 rave reviews and the loudest cheers and standing ovations for every performance. It’s a show that’s not to be missed,” shares Sr. Advisor for Creative Marketing & Multimedia Businesses, Joe Caliro. Newsies is based on a historic strike in New York City, where a group of young boys demanded fair wage from Joseph Pulitzer and William Randolph Hearst, two of the country’s biggest newspaper publishers. The outcome of the strike, both in history and in the musical, encourages viewers to fight for what’s right, no matter how big the foe. This happened on 21st of July, which marks the 118th anniversary of the newsboys' strike, making this performance of Newsies all the more special. The inspiring story was delivered through the catchy songs, developed by the award-winning composer Alan Menken, who also created the music for The Little Mermaid, Beauty and the Beast, Hercules, and many more. Newsies won a Tony Award for Best Original Score, and Globe LIVE did it justice by curating a stellar cast led by Gian Magdangal as strike leader Jack Kelly, Danielle Chopin as journalist Katherine Plumber, Jef Flores as Davey, and Pinky Marquez as performer Medda Larkin. Of course, the rest of the cast performed just as well, hitting the right notes while dancing and acting. Don’t miss out on the infectious “Seize the Day” and “King of New York”! When they say Newsies is one of the most difficult shows to produce, they weren’t kidding. The Broadway production also won a Tony Award for Best Choreography, which isn’t surprising considering it combines ballet, hiphop, tap, jazz, gymnastics, and more. To prepare the cast, Globe LIVE established Training Ground, a series of sessions with choreographer PJ Rebullida, where the cast took singing, dancing, and acting training to become triple-threats. Watch the series online at go.globe.com.ph/newsies.html. The singing, acting, and dancing is accompanied by a live orchestra, which makes the show an even more electrifying watch. The band is hidden at the back, but they make their presence felt with every instrument they play, making the audience want to dance and clap along. Every story has a love angle and in Newsies, it’s between Kelly and Plumber. Besides striking against the country’s top publishers, Kelly is also pursuing Plumber, a smart and beautiful woman from an established family. Sparks fly between the two of them and the audience can’t resist swooning every time. Globe LIVE and 9WT created a breathtaking set at the outdoor amphitheater of the Globe ICONIC Store, where the large cogs and three-level scaffoldings could be moved around between scenes. This was the perfect setup for the actors, who maximized the stage with their pirouettes and backflips. We used projection mapping to create the classic turn-of-the-century NYC backdrop, which adds authenticity and feel to the set. At the start of the show, Caliro entered the stage to encourage the audience to cheer and have fun instead of just politely clapping (after all, it's outdoors!). The result? The audience went wild after each number, creating a fun and vibrant atmosphere that redefined the Filipino theater experience. 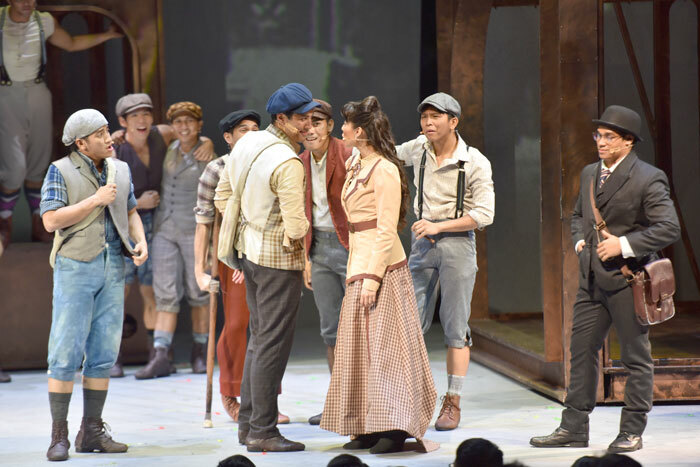 Those who haven’t seen Globe LIVE and 9 Works Theatrical’s Newsies can still catch up as it is on its last run this weekend. Don’t miss out on the chance to seize the day! For more information, visit the website at http://go.globe.com.ph/newsies.html. Tickets are available at https://www.ticketworld.com.ph.